You probably are diagnosed with depression. You perhaps lost your work and some friends. Dealing with your health condition alone can be suffocating and stressful. Why don’t you try to adopt dogs? Dogs are proven to help people in different ways. Whether you’re depressed after losing a job or breaking up with someone, dogs are an effective pain reliever. The natural cuteness and jolliness of dogs can put an end to your condition. 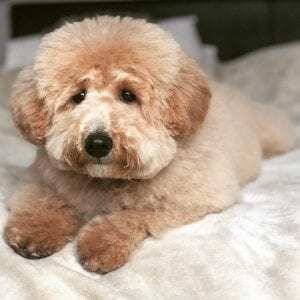 However, what teddy bear dog breeds you have in mind. Well, it’s hard to pick. If you have enough resources, you will choose them all. Overly confident trouble maker? Fun cuteness? You perhaps are looking for Pomeranian teddy bear. They are confident and curious. Teddy bear pomeranians are playful and cute. They love treating like a prince or princess. Pomeranian teddy bear has a zest of life. They are energetic and active. However, establishing some house rules should not be overlooked. They are stubborn with potty training. They are also known for excessive barking. Teddy bear Pomeranian is a perfect accomplice for all your adventures. Whether you want to go swimming or running, they love intense and fun activities. They enjoy following their pet owners, so don’t be surprised when they are always behind you. teddy bear Pomeranian also loves new experiences. Provide them with many opportunities to explore and socialize. They will have fun. However, don’t forget that they are sensitive to heat. Cool them off often to avoid health complications. Plus, regular grooming can make a huge difference. Known as a hybrid between a Bichon Frise and a Poodle, Poochon teddy bear dogs are a great family pet. They are cute, lively and adorable, completing your day after a stressful work. Poochons’ average lifespan is around 15 years. They are small and easy to carry. Whether you need to go to the supermarket or travel, Poochons are right to try. Poochons are also convenient to train. However, teach them at a young age. Compared to other breeds, Poochons don’t shed much. Still, regular grooming and cleaning are a necessity. As with other breeds, Poochons are intelligent. They love socializing with other dogs. If they left alone at home for an hour or two, they could suffer from extreme separation anxiety. If you go home for work every day, Poochons are not a great choice. Poochons are also ideal with older children although they can be boisterous when playing. Another thing is that they require proper exercise or mental stimulation. These keep them happy and healthy. 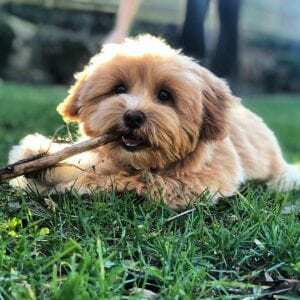 A mix between Shih Tzu and a Poodle, Shih-Poo teddy bear dogs are intelligent and convenient to train. They are also independent but don’t leave them at home for hours. They need your care, affection, and comfort. More than that, they require regular exercise. Every day, burn your calories with them. From running to walking, these are excellent drills to give a shot. When it comes to grooming needs, Shih-Poo can be quite hard to groom. However, it depends on different factors like the coat. Count on and trust a qualified groomer to avoid the hassles. Shih-poos also come in a range of colors. They can be black, red, white, and brown. 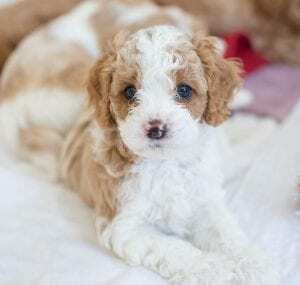 Mini Shih poo inherit the affectionate personality of Shih-Tzu. They are smart, a common trait of a Poodle. Don’t forget to train and socialize these dogs at a young age. This helps them become confident and happy when they mature. You may be looking for a big teddy bear dog! Goldendoodles are a great option. 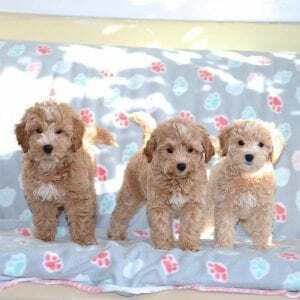 They are a crossbreed between a Miniature Poodle and a Golden Retriever. Mini Goldendoodles are a great option as a family pet. 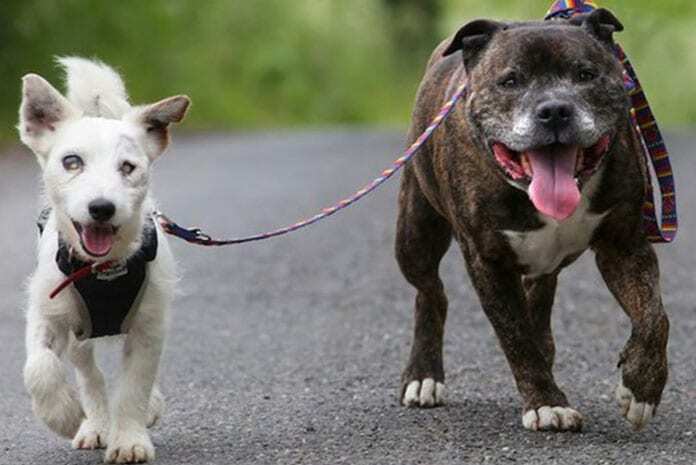 They are confident, loving and loyal dogs. Can be trained easily. Thanks to their natural social personality and high intelligence. Unfortunately, their loyalty means they have a high risk of separation anxiety. Please don’t leave them for too long. Alternatively, when you’re going to work for the whole day, make sure there’s someone else at home. As with other hybrids, Goldendoodles’ grooming needs may vary depending on their coat. Consult an experienced veterinarian for practical solutions. When it comes to colors, they can be black, red, golden, grey, chocolate or cream. Just like other dogs, they need proper exercise. Provide them with enough playground where they can run and explore. Small and cramped apartments are not useful. Maltipoos are a cross between a Poodle and Maltese. They are relatively small, grow up to 14 inches tall. These dogs are lightweight or easy to carry during travel. Maltipoos are loving and smart. They respond to training well. They are perfect for families who can dedicate their time to taking care of these cute breeds. Most Maltipoos have curly poodle coat, and regular grooming is essential. For them to stay fit and healthy, daily exercise is essential. Unfortunately, Maltipoos can be vulnerable to many health issues. These can include patellar luxation, skin problems, epilepsy, and progressive retinal atrophy. When it comes to lifespan, Maltipoos can last up to 13 years. It’s the average lifespan. However, a healthy diet and fun activities can make a difference. Please don’t leave them in a room for months. Grab sports competitions for dogs. These are helpful and worth your time. A crossbreed between a Poodle and a Schnauzer, Schnoodles are another teddy bear dog breed you shouldn’t miss. 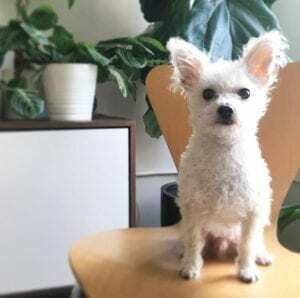 Their size depends on the poodle used — a small Schnoodle measure up to 30cm. A large one, on the contrary, measures twice. The color of their coat also varies. It depends on what they inherit from their parents. The luster of their coat and the length of their curl are no exception. When it comes to temperament, they are generally loyal and affectionate. However, some can be aggressive, especially in front of strangers and other dogs. Socializing them at a young age is perfect. This helps them become more comfortable around new animals and people. As they are well-socialized, Schnoodles can have a good rapport with other breeds at home. 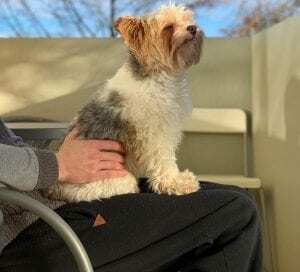 Healthy and happy Schnoodles can live longer. Their average lifespan is around 15 years. Common diseases can include progressive retinal atrophy, epilepsy, elbow dysplasia, patellar luxation, and cataracts. Do you want a mini teddy bear dog? Everyone is eager to have a dozen at home. A great choice can be Morkies, a hybrid of Yorkshire terrier and Maltese. They are a social and loving crossbreed. They love playing with many people, making them ideal for different families. Since they are small, Morkies can be hurt easily. This means meticulous care is imperative. They are perfect for families without small children. Unlike other breeds, Morkies don’t need strenuous exercise. A daily and simple walk is enough. If you have a small space at home, they are a great option. Aside from that, Morkies can be stubborn. It would help if you were patient when training them. Every time they commit mistakes, don’t reprimand or punish them. This can lead to aggression and other expensive problems. However, wait, there’s more! Morkies are energetic and playful. They are likely to bark a lot when left alone for a few minutes. When it comes to health problems, these can include hypoglycemia and patellar luxation. A relatively small cross between a Cavalier King Charles and a Poodle, Cavapoos are social, faithful, and smart. They respond to training quickly. Still, it can be a challenge. Hire a reliable trainer to turn your goals into a reality. Due to the thick coat, Cavapoos require expensive maintenance and grooming. Visit the nearest clinic to exceed this breed’s grooming needs. Known to have a loving personality, Cavapoos are prone to separation anxiety. The factor to blame is leaving them alone for hours. It’s better to bring them whatever your schedule. As with people, Cavapoos should exercise. Let them run or walk with you every day. This helps them become fit and healthy, protecting them from expensive health issues. With a good diet and exercise, they can live longer up to 15 years. When they suffer from hip dysplasia, diabetes, or syringomyelia, consult their vet at once.When detected at an early stage, your Cavapoos can be free of complications. A regular check-up is worth it. You probably love Maltese and Shih Tzu. However, taking care of both breeds can be a headache. Why don’t you try the Malshi? 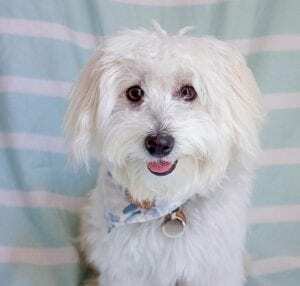 A mix between Shih Tzu and Maltese, Malshi is a beautiful family pet you can afford. Malshis are relatively small with prominent and charming personalities. They are a fast learner and love, making the training process stress-free. Raising Malshis without proper socialization and training can be a big factor of this breed’s aggression in different situations. This can result in excessive barking, affecting your focus every day. The health problems that are common to this breed include elbow dysplasia, hypothyroidism, eye issues, and patellar luxation to name a few. Malshis can live longer as you’ve expected. They can last up to 14 years old. Aside from fun activities, groom them daily to prevent tangles or knots. Right grooming also keeps their coat shiny, odor-free, and silky. Another crossbreed is Cairnoodle. It’s from a Poodle and Cairn terrier. Just like other teddy bear dogs, Carnoodles are small although they are full grown. They are happy, social, affectionate and independent. When socialized and trained at a young age, Cairnoodles are an excellent family pet. They are obedient and can interact with animals and strangers. Unfortunately, Carnoodles have a high risk of suffering from separation anxiety. This is particularly true when they are alone for hours. Spend quality time with them to have a happy, quality and long life. Other effective ways are attending regular check-ups with a specialist, feeding them with nutritious food, and providing a good exercise. Don’t forget Carnoodles’ grooming needs. Bathe them on a regular basis, clip their nails properly, and brush their fur. Avoid human shampoos and be cautious when selecting dog soaps. Pick the one with positive customer reviews. Looking for a cheerful, loving, and cute trouble maker? Then, Bichon Frise can be your real-life teddy bear. 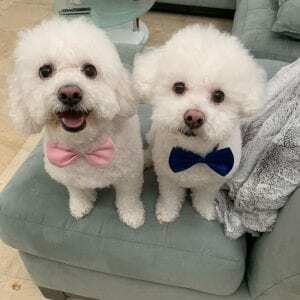 What many dog owners love about the Bichon Frise is that they are intelligent, silly, cuddly, and affectionate. For that silliness, they only need some simple exercise. Help them excel and live their lives to the fullest. They are also adaptable. Whatever the living environment you have, they can quickly adapt. This makes them excellent apartment pets. However, the Bichon Frise is extremely sensitive. Don’t scold them when they poop on the couch or pee on the bed. What they need are gentle training, unconditional love, and a positive environment. With all these things, they can grow responsible. For new Bichon Frise owner, you can search the net for training information. However, it’s not enough! Hire a professional trainer to achieve the best results. Yes, it can be expensive. The good news is that a responsible Bichon Frise is worth the cost. After a stressful work, you may lose your energy and confidence. 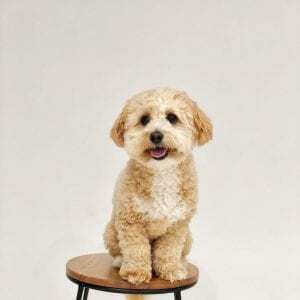 However, with an affectionate and intelligent teddy bear dog like Cockapoo, they can help bring back your smile and passion. Their fuzzy hugs and a natural smile would make you positive again. Despite the difficulty of your job, you’d handle the stress easily. Cockapoo teddy bear dog has the drive to please their loved ones. This makes them an ideal training partner and a pain reliever. For first time owners, this breed is perfect for you. They are gentle and loving. More than that, they are easy to train and handle. However, Cockapoo requires constant grooming to stay fresh and odor-free. Well, some see this a disadvantage. However, it’s not a big deal for others. Cockapoo is a quiet and non-drooling breed. Provide them with daily exercise and good food. They need to be fit and healthy just like the other breeds. 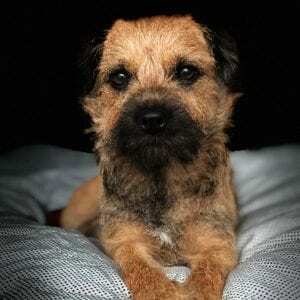 Border terrier is one of the most active teddy bear breeds. They work and play hard. Initially, they were trained to hunt foxes. However, things have changed. They have become pets of most dog lovers out there. Border terrier loves running, digging and chasing. This means they can be a challenging breed to adapt. If you don’t have that long patience, it’s better to choose the right teddy bear breed. Just like other dogs, the Border terrier is intelligent and loyal. When training a cute pup, you won’t experience some trouble. However, training this breed still requires your hard work and determination. Without such qualities, you might end up stressed. Not only that, Border terrier has unlimited energy. Initially trained for hunting, your dog needs an active daily lifestyle. It can be fun and challenging. Every day, a simple exercise is enough. For useful drills, ask help from a professional. Plus, provide the ideal food for optimal well-being. Originally, Lhasa Apso was a guard in high places in Tibet. With the blood of a courageous dog, they still carry that proud duty these days. Are you searching for independent dogs? Don’t look further than Lhasa Apso. They are responsible and brave. They make decisions on their own. However, they seem stubborn sometimes. When it comes to protecting, they take it very seriously. Well, they look weak. However, they are brave and unkind to strangers. They will protect you up to the maximum. They are also loyal and honest to their family. Treat them with care to love and comfort you back. More than that, Lhasa Apso is a strong-headed breed. For new trainers, you may experience a hard time teaching them with basic skills. They need consistent training and long patience. What’s important is that socialization opportunities play a crucial role. Let them socialize with their peers to overcome aggression. Before you adopt a Lhasa Apso puppy, choose the right breeder. You probably are unaware about Pekingese. It’s no surprise because this is a unique breed that originates from China. What makes them more different is their coat. They are usually groomed stylishly and attractively. A teddy bear cut from a trusted groomer transforms them into an adorable cub. Pekingese will stand out every time you join competitions. They are cute and delightful, making it a good family pet. They love playing with all household members. Whenever you feel down, their warm hugs are soothing and inspiring. Pekingese also has an independent spirit. They make their own rules. No wonder when they are stubborn during potty training. They bark at everything. 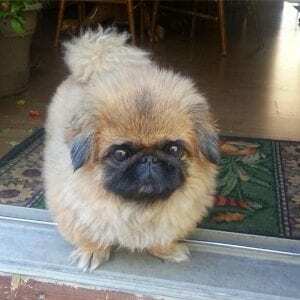 For families with small children and other dogs, Pekingese are not the right option. However, proper training ensures responsible Pekingese. They tend to be affectionate and loving. They are caring and loyal after positive and holistic training. 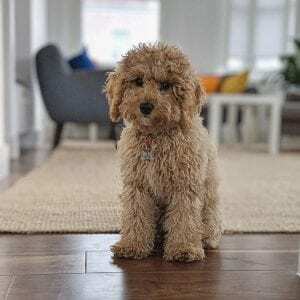 Toy poodle is not the number one teddy bear dog you may consider. However, with a little grooming magic, you’ll be amazed. A teddy bear cut would change your mind. As the top of their class, poodles are one of the smartest breeds you can ever have. They are motivated to please their owners. With their brain, they are active during training. They are keen and intelligent. They are easy to deal with. Plus, it’s enjoying to have cute and lively poodles at home. At a young age, they are full of energy. They bark a lot as a puppy. They enjoy digging and running. So, don’t be mad when your couch, furniture, and floor are messy. On top of that, poodles need an assertive leader. You need to set rules and provide a set of exercised every day. As they mature, they become calmer. Still, they need activities to stimulate their body and mind. Yorkies want to be a star on their show. They love to be the center of the attraction. Moreover, they never disappoint the audience. They catch everyone’s attention and interest. Yorkshire terrier has a fantastic personality to show off. They come with some sass. Trained initially to hunt rodents, Yorkshire terrier still has that trait. When the number of rats skyrockets in your house, Yorkies can help. As with other teddy bear dogs, Yorkshire terrier lives for companionship. What many owners love about Yorkies is that they show endless trust and love. They are loving and caring. However, Yorkies only love their owner throughout their lives. They do not welcome someone else. Well, they can be unkind with strangers and dogs. They can be aggressive to other household members. Yorkshire terrier is also eager to play. They are perfect for singles. With a high percentage to be aggressive, they are not ideal for families with children. Please give them a teddy bear trim to become adorable. Another teddy bear is chow-chow. They are cuddly and have an independent spirit. Chow-chows are often suspicious of other animals and strangers. They are known to be protective. Every time someone else approaches you, chow-chow may bark a lot. Don’t be surprised because they want to protect you. Well, this can be an advantage. However, this can be a hassle for some. This is where extensive training comes in. Teach them with the right skills to give you peace of mind. Early training or socialization is a good way for your chow-chow to accept children and strangers. 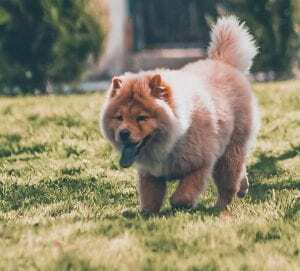 If you plan to adopt an old Chow-chow, don’t ignore experienced trainers. However, it’s not enough. Search the net for information. When it comes to grooming, a panda or teddy bear cut is the trend. Give this style a shot and see how your chow-chow changes for the best. They’d look adorable and fun to play with. Keeshond has a grey coat that resembles a wolf’s mane. At a young age, they look like a bear cub with rounded ears and nose. As they mature, they lose their cub-like appearance. Aside from playing with their toys, Keeshond enjoys spending time with their family and loved ones. They are a social animal. They socialize to any household members and strangers. However, please don’t leave them alone at home. Your furniture, couch, and rugs will be messy. Keeshond loves following you everywhere. Whether you go in the bedroom or kitchen, they will follow you everywhere. 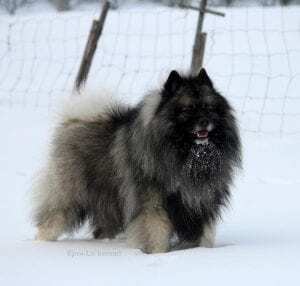 What owners find interesting about Keeshond is their shiny coat. However, it’s hard to maintain. It needs love and constant brushing to avoid shedding. Visit a groomer on a regular basis. Keeshond also barks and yells a lot. When you have an elderly or sick member in the house, they are not an ideal choice. 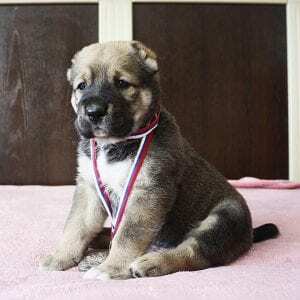 Consider other teddy bear breeds in this list. 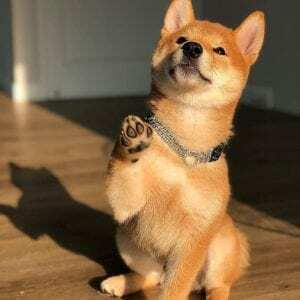 A unique breed from Japan, Shiba Inu is known to have a hilarious personality and an assortment of quirks. The good news is that they are independent and stubborn. They may not follow your command during training. However, they are incredibly intelligent. They can master the skills in real time. Training Shiba Inu can be frustrating. Only experienced owners and seasoned trainers can handle Shiba effectively. They may seem unideal for new owners. However, everything is possible. Enroll in a class and do your homework. Shiba Inu has a high prey drive. They are alert and attentive. They bark at strangers and chase small creatures. With training, comfort, and socialization, they can adapt to your family environment. They can also become friends, lessening their aggression. However, it takes time, and it does not happen overnight. It’s a long process. So, be patient and persistent. Most importantly, love your dog up to the fullest. Bear is fearless and powerful. 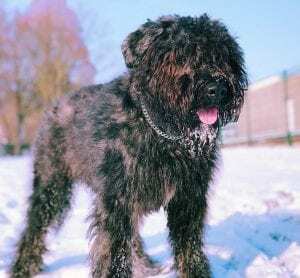 Bouvier des Flandres is no exception. Originally bred to work on farms, Bouvier is used to protecting livestock. 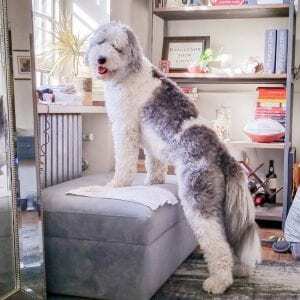 Energetic and eager every day, Bouvier needs exercise. Without regular drill, they may be unhealthy and slow over time. Please think of the best activities for them. Alternatively, seek assistance from a seasoned trainer. With that significant stature, Bouvier has that confidence and courage. They are brave and powerful. They are always on the go to defend the pack. This makes them the wrong option for new pet owners. What they need is an assertive leader. Many people believe that Bouvier is tough and stubborn. It’s just a myth. They are incredibly gentle and affectionate. They love their owners and children, too. However, they are aggressive when they see strangers and other animals. Expose them to many activities. Let them socialize with other breeds to overcome their aggression. Commonly called as the Russian Bear or Ovcharka Dog, Caucasian Shepherd Dog is a large breed. They weigh around 200 pounds. Because of that, they were initially used in the Russian military. One of their duties was to guard livestock. Having that attitude over the years, Ovcharka takes guard duty seriously these days. While guarding your home, they can protect you from burglars. However, they sleep all day long when they have nothing to do. They are lazy and simple exercise plays a significant role. Let them work in acreages or farms. While they nap, roam and protect your property, provide them some love and comfort. Most importantly, Caucasian needs extensive training. It’s better to teach them the right skills at a young age. As they mature, they are likely to be more responsible and active. Hire a trainer to make things simpler. Don’t handle the process alone. Have you been dreaming of a Rottweiler? However, is the size of a big issue? Well, a Shorkie is a perfect alternative. A small breed, Shorkies are an energetic pooch. Their character is tremendous despite their size. 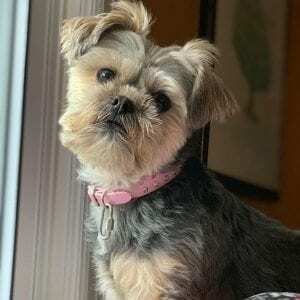 When you’re in search of a purebred dog, Shorkie is not the right family pet to select. A Morkie is your best shot. A stubborn, feisty and loyal protector, Shorkies are ideal for homes without kids. However, for those with older children, this breed is worth your time and effort. This jolly dog weighs around 5 or 12 pounds. Their height is between 9 and 11 inches. When it comes lifespan, Shorkies can live up to 16 years. However, an active and healthy lifestyle should be a top priority. 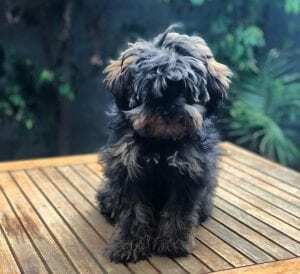 Are you in search of a beautiful teddy bear dog? 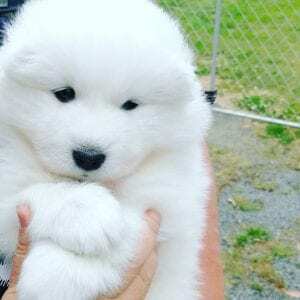 Samoyed is here for you. They have an attractive white and fluffy coat that resembles a polar bear. Toy samoyed love to be the center of attention. They are sweet natured. Don’t forget to cuddle them every moment. They’d enormously enjoy it. What makes Samoyed a great member of the family is that they are affectionate and loyal. They love children, too. Samoyed is an intelligent breed. This makes training full of joy. Whether you’re a newbie or experienced in dog training, you’d encounter less trouble. While you can avoid the hassles of potty training, Samoyed can master the skills ahead. Despite that, Samoyed can be stubborn. Unlike other breeds, they are a working dog. They require daily runs or intense tasks. Without drills and roles every day, they get bored quickly. They may destroy your couch, rug and other pieces of furniture. So, it’s necessary to provide them with fun activities. Sheepadoodles have been popular over the past few years. It’s no wonder because they have a unique appearance. They are a beautiful and attractive breed to raise today. Just like other dogs out there, Sheepadoodles are friendly and obedient. They follow commands with a big heart and are not stubborn. They are active, child-friendly, and hassle-free to train. However, Sheepadoodles are not a pure dog breed. They are a mix of a sheepdog and a poodle. They are known because of their exceptional cuddles, loyal companionship and stable temperament. So, what’s your thought? What type of teddy bear breed do you want to adopt? Whatever your choice, it’s the right decision. It’s something you won’t regret over time. Learn other tips to become a responsible pet owner. Raising cute dogs is fulfilling and enjoying. Looking for help to find a reputable breeder to get either a Multipoo or Shihpoo male puppy. Thank you!